The 9K720 Iskander (Russian: «Искандер»; NATO reporting name SS-26 Stone) is a mobile short-range ballistic missile system produced and deployed by the Russian Federation. The missile systems (Искандер-М) are to replace the obsolete OTR-21 Tochka systems, still in use by the Russian armed forces, by 2020. The Iskander has several different conventional warheads, including a cluster munitions warhead, a fuel-air explosive enhanced-blast warhead, a high explosive-fragmentation warhead, an earth penetrator for bunker busting and an electromagnetic pulse device for anti-radar missions. The missile can also carry nuclear warheads. In September 2017, the KB Mashinostroyeniya (KBM) general designer Valery M. Kashin said that there were at least seven types of missiles (and "perhaps more") for Iskander, including one cruise missile. The road-mobile Iskander was the second attempt by Russia to replace the Scud missile. The first attempt, the OTR-23 Oka, was eliminated under the INF Treaty. The design work on Iskander was begun in December 1988, initially directed by the KBM rocket weaponry designer Sergey Nepobedimy, and was not significantly affected by the dissolution of the USSR in 1991. The first successful launch occurred in 1996. In September 2004, at a meeting with senior defense officials reporting to President Vladimir Putin on the drafting of a defense budget for 2005, the Russian Defence Minister Sergei Ivanov spoke about the completion of static tests of a new tactical missile system called the Iskander. He said that the system would go into quantity production in 2005 and toward the end of that year, Russia would have a brigade armed with it. In March 2005, a source in the Russian defence industry told Interfax-AVN the development of new missiles with a range of 500–600 km, based on existing Iskander-E tactical missile systems, was a possibility. He said, however, that it "may take up to five or six years". In 2006, serial production of the Iskander-M Tactical Ballistic Missile System was launched, and the system was adopted by the Russian army. The production cost of the missile system was reported in 2014 to have been slashed by 30%. In November 2016, the Russian military announced that the modernisation of the Iskander-M System was under way. A number of countries were reported to have shown interest in purchasing the export version of Iskander, but such possibility was only announced in early February 2017. The United States has argued that the cruise missile version SSC-8 R-500 Iskander-K is in violation of the INF Treaty because its estimated range is beyond 500 km. The Iskander ballistic missile is superior to its predecessor, the Oka. 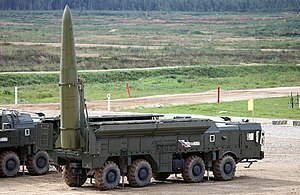 The Iskander-M system is equipped with two solid-propellant single-stage guided missiles, model 9M723K1. Each one is controlled throughout the entire flight path and fitted with an inseparable warhead. Each missile in the launch carrier vehicle can be independently targeted in a matter of seconds. The mobility of the Iskander launch platform makes a launch difficult to prevent. Targets can be located not only by satellite and aircraft but also by a conventional intelligence center, by an artillery observer, or from aerial photos scanned into a computer. The missiles can be re-targeted during flight in the case of engaging mobile targets. Another unique feature of Iskander-M  is the optically guided warhead, which can also be controlled by encrypted radio transmission, including such as those from AWACS or UAV. The electro-optical guidance system provides a self-homing capability. The missile's on-board computer receives images of the target, then locks onto the target with its sight and descends towards it at supersonic speed. Boost phase thrust vector control (TVC) is accomplished by graphite vanes similar in layout to the V-2 and Scud series tactical ballistic missiles. According to some rumors, in flight, the missile follows a quasi-ballistic path, performing evasive maneuvers in the terminal phase of flight and releasing decoys in order to penetrate missile defense systems. The missile never leaves the atmosphere as it follows a relatively flat trajectory. The missile is controlled during the whole flight with gas-dynamic and aerodynamic control surfaces. It uses small fins to reduce its radar signature. The Russian Iskander-M travels at a hypersonic speed of 2100–2600 m/s (Mach 6–7) and an altitude of 50 km. The Iskander-M weighs 4,615 kg, carries a warhead of 710–800 kg, has a range of 500 km and achieves a circular error probable (CEP) of 5–7 meters (when coupled with optical homing head; 30-70 m in autonomous application  ). It is rumored that during flight it can maneuver at different altitudes and trajectories and can turn at up to 20 to 30 G to evade anti-ballistic missiles. This rumor causes great controversy between critics with many argued that Iskander aerodynamic layout and cruising altitude will not allow it to perform high-G maneuver due to lack of lift. Iskander is a tactical missile system designed to be used in theater level conflicts. It is intended to use conventional or thermonuclear weapon warheads for the engagement of small and area targets (both moving and stationary), such as hostile fire weapons, air and anti-missile defenses, command posts and communications nodes and troops in concentration areas, among others. The system can therefore destroy both active military units and targets to degrade the enemy's capability to wage war. In 2007, a new missile for the system (and launcher) was test fired, the R-500 [ru] cruise missile, with a range of applications up to 2000 km or more. Presently, "Iskander-M" system, outfitted with cruise and ballistic missiles, is being delivered to the military. In 2013, army missile brigades first received missiles equipped with a new control system. As of 2018, Iskander missile complex can now strike static sea targets. The system can be transported by various vehicles, including airplanes. The maximum power for the nuclear warhead is 50 kiloton TNT (Iskander-M). The first documented use of the Iskander has been in the Russo-Georgian War. After the death of Dutch journalist Stan Storimans on August 12, 2008 in Gori an investigation by the Dutch government revealed that a single, 5 mm fragment from an anti-personnel sub-munition, propelled by an Iskander missile, killed the Dutch journalist. In November 2008, the Russian president Dmitry Medvedev in his first annual address to the Federal Assembly of Russia announced plans to deploy Iskander missiles to the Kaliningrad Oblast, Russia′s western-most territory on the south-eastern coast of the Baltic Sea, if the U.S. went ahead with its European Ballistic Missile Defense System. On 17 September 2009, US president Barack Obama announced the cancellation of the U.S. missile defense project in Poland and the Czech Republic. The following day, Moscow indicated it might in turn cancel the plans to deploy Iskander missiles to Kaliningrad; a few days later, the decision not to deploy was confirmed by Medvedev. 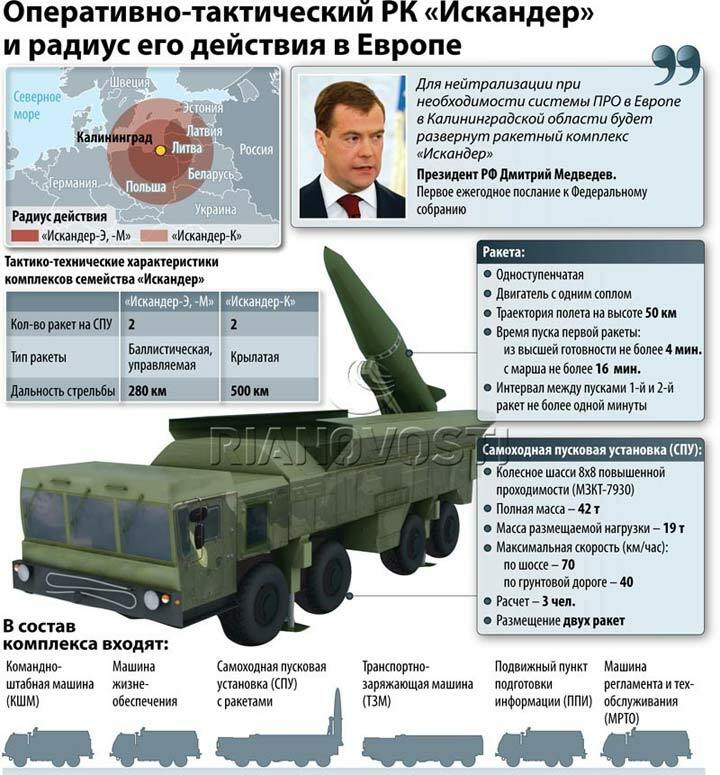 On 23 November 2011, President Medvedev indicated that Russia might deploy Iskander tactical missiles in the Kaliningrad region as part of Russia's reaction to the United States' reformulated missile defence plans in Europe. In December 2013, President Vladimir Putin denied Western media reports that Russia had deployed Iskander missiles in the Kaliningrad Oblast. According to Russian media reports, in December 2014 and in March 2015, Russia deployed Iskander missiles to the Kaliningrad Oblast as part of military exercises. On 8 October 2016, the Russian military confirmed that they had moved Iskander-M missiles into the Kaliningrad oblast, adding the move was part of routine drills and had happened previously multiple times and would happen in future. A few days after, Chairman of the Defense Committee of the Russian State Duma Vladimir Shamanov commented that the transfer of missile systems Iskander-M into the Kaliningrad region had been effected to counter potential threats from the U.S. missile defense facilities that had been stationed in Europe as well as those that might be stationed subsequently. In early February 2018, Shamanov confirmed that Russia had deployed an unidentified number of Iskander missiles to the Kaliningrad region. Days prior, the local military commanders said that the "park zones" for Iskander missiles deployment had been completed in the Kaliningrad region, as well as in North Ossetia. In September 2009, the Russian military announced plans to deploy Iskander missiles in all the military districts of Russia "in a short time". According to the Stratfor report in 2010 there were five Iskander brigades stationed and operational in Russia, namely the 26th Rocket Brigade in the town of Luga, Leningrad Oblast, south of St. Petersburg; 92nd Rocket Brigade at Kamenka, near Penza in the Volga region; 103rd Rocket Brigade at Ulan-Ude, north of Mongolia; 107th Rocket Brigade at Semistochni, in the Far East; and the 114th Rocket Brigade at Znamensk, in the northern Caucasus. In June 2013, it was revealed that Russia had deployed several Iskander-M ballistic missile systems in Armenia at undisclosed locations. In 2016, it was reported by media that Armenia had received a divizion of Iskander missiles. In November 2014, US General Breedlove stated that Russian forces "capable of being nuclear" had been moved into Crimea, the Ukrainian peninsula which the Russian Federation had annexed in March, and the following month Ukrainian Armed Forces announced that Russia had deployed a nuclear-capable Iskander division in the territory. Russian Foreign Ministry officials declared the right to deploy nuclear weapons in the peninsula, which is generally recognized as part of Ukraine, in December 2014 and June 2015. In March 2016, at least one Iskander system was reportedly deployed at Russia's Hmeimim airbase in Syria. In January 2017 an Israeli company claimed satellite photography confirmed the Syrian deployment. According to a Fox News report in early February 2017, four Iskander missiles had been fired at opposition targets in the Idlib province in Syria. RF Deputy Prime Minister Yury Borisov reported in late 2018 that the Iskander-M missile system as well as the Tornado-G and Smerch rocket launchers had proved their effectiveness in combat in Syria. Variant for the Russian Armed Forces with two 9M723 quasi ballistic missiles with published range 415 km, rumoured 500 km. Speed Mach 6-7, flight altitude up to 6–50 km, nuclear capable stealth missile, controlled at all stages, not ballistic flight path. Immediately after the launch and upon approach to the target, the missile performs intensive maneuvering to evade anti-ballistic missiles. The missile constantly maneuvers during flight as well. 9M728 (SSC-7) also known as R-500 – flight altitude up to 6 km, published range up to 500 km although it may be higher and automatic adjustment in the way, follow of terrain relief in flight. The missile is evolved from 3M10, 3M54/3M14 and Kh-101/102 missiles and can be launched also by the Iskander-M.
9M729 (SSC-8) – new long-range missile that is reportedly land-based version of the 3M14 (SS-N-30) Caliber-NK missile complex with a range between 300–3,400 miles (480–5,470 km) and may be based even on the air-launched Kh-101 cruise missile with a range over 5,500 kilometres (3,400 mi). According to RF, its range is only 480 km and its specially-developed self-propelled launcher can carry 4 missiles. The 9M729 missile has a higher yield warhead and a new control system for greater accuracy. Most parts and components of the 9M728 and 9M729 missiles are identical. Currently there are 7 different types of ballistic and cruise missiles for both variants of the Iskander missile system. The director of the state corporation Rostec Sergey Chemezov said – Missile complexes "Iskander" is a serious offensive weapon capable of carrying a nuclear warhead. This ballistic missile system is in the military list of products prohibited for export. Sergey Chemezov: "Iskander" missile complexes cannot be exported. However, the export variant is known as Iskander-E and its first foreign operator became Armenia, a Russian ally and a member of the Collective Security Treaty Organization (CSTO). Iskander-E has a maximum range up to 280 km and is fitted with a simplified inertial guidance system. The Iskander-E can also use missiles that carry warheads with cluster munitions. Russia – 136 units (11 rocket brigades with 12 units each, and one unit with 4 units at Kapustin Yar). In service with the Western Military District since 2010. Missiles are also deployed in Armenia. Two deliveries in 2013. Missile units in Krasnodar and Stavropol territories as well as in the Republic of Adygea in the 49th Army of the Southern Military District, and a missile brigade in the Eastern Military District received Iskander-M in 2013. One more delivery in July 2014. Missile brigade, stationed in the Orenburg region, rearmed on "Iskander-M" on 20 November 2014. 6th brigade delivered on 16 June 2015 to unit in Ulan Ude (presumably the 103rd Rocket Brigade). Seventh brigade delivered in November 2015 to the Southern Military District. All scheduled 120 complexes. 20th Independent Guards Rocket Brigade – 5th Red Banner Army of the Eastern Military District (the brigade stationed in Spassk-Dalniy, Primorsky Krai) – in June 2016. One more delivery in November 2016 to the Central MD. Next delivery conducted in 2nd quarter of 2017. The contract for two more brigades and cruise missiles for the system signed in August 2017 will increase the total number of rocket brigades to 13. A brigade set of Iskander-M tactical ballistic missile systems has been delivered to the personnel of a missile large unit in the Western Military District in late 2017. Armenia – 25 units. Several systems were displayed at the Independence Day parade rehearsal in September 2016. Two managers of the Russian military-industrial complex Rosoboronexport confirmed that four 9K720 Iskander systems were delivered to Armenia per CSTO arms agreement, thus making Armenia, a country in military union with Russia, the first foreign state to have the missile system. In February 2017, the Defence minister of Armenia told a Russian mass media outlet that the Iskander missiles stationed in Armenia and shown at the military parade in September 2016 were owned and operated by the Armed Forces of Armenia. Algeria – 4 regiments (48 launchers). During the Dubai Airshow 2017 exhibition, representatives of the Federal Service of Military-Technical Cooperation officially confirmed that the Iskander-E missile system was delivered to one of the countries in the Middle East and North Africa region. French defense writer Philippe Langloit wrote in the September–October 2017 issue of DSI magazine that Algeria had received 4 Iskander-E regiments. It was confirmed by Kommersant magazine. ^ "Russian officials confirm use of Iskander-M short-range ballistic missile in Syria – Defence Blog". ^ "Iskander/SS-26". Federation of American Scientists. ^ "Iskander (SS-26)". CSIS Missile Threat. ^ "Iskander M/E (SS-21 / SS-26)". Archived from the original on 2014-12-23. Retrieved 23 December 2014. ^ "Ударная Сила: Ракетная паутина (оперативно-тактический ракетный комплекс 9К720 "Искандер" SS-26 "Stone") » RNNS.RU". Retrieved 8 October 2016. ^ "MilitaryRussia.Ru — отечественная военная техника (после 1945г.) - Статьи". Retrieved 23 December 2014. ^ "Дмитрий Рогозин: "Искандеры" будут размещены в Калининграде". Retrieved 23 December 2014. ^ a b Минобороны пообещало полностью оснастить ракетные войска «Искандерами» RBC, 18 November 2016. ^ "NATO Members Alarmed by Russian Nuclear Missile Deployment". Retrieved 23 December 2014. ^ Ракетный комплекс "Искандер-М" получил новые типы ракет TASS, 14 September 2017. ^ "Великий воин и защитник "Искандер"" (in Russian). VPK. 10 February 2014. ^ Вероника Ушакова (2014-05-19). "Ракетная эра Непобедимого" (in Russian). Krasnaya Zvezda. Retrieved 2017-09-14. ^ a b "Россия модернизирует "Искандер"". Retrieved 23 December 2014. ^ "Стоимость оперативно-тактического ракетного комплекса "Искандер" снижена практически на треть". Retrieved 23 December 2014. ^ Hans M. Kristensen (2014-07-30). "Russia Declared In Violation Of INF Treaty: New Cruise Missile May Be Deploying – Federation Of American Scientists". Fas.org. Retrieved 2018-08-22. ^ "Оперативно-тактический ракетный комплекс "Искандер-Э" - АО Научно-производственная корпорация "КБ Машиностроения"". Retrieved 8 October 2016. ^ a b "Оперативно-тактический ракетный комплекс 9К720 'Искандер' - Ракетная техника". Retrieved 8 October 2016. ^ "SS-26 (Iskander) – Missile Threat". CSIS. ^ "Ударная Сила: Ракетная паутина (оперативно-тактический ракетный комплекс 9К720 "Искандер" SS-26 "Stone")". rnns.ru (in Russian). 25 October 2009. Retrieved 23 December 2014. ^ "ТАСС: Армия и ОПК". Retrieved 8 October 2016. ^ "Iskander missile complex can now strike sea targets". 3 August 2018. ^ a b c "Ракетный комплекс "Искандер"". Retrieved 23 December 2014. ^ a b "- 9723". Retrieved 23 December 2014. ^ Zaken, Ministerie van Buitenlandse. "Bijlage: verslag onderzoeksmissie Storimans – Kamerbrief inzake het verslag van de onderzoekscommissie- Storimans". www.rijksoverheid.nl. Archived from the original on 2018-02-28. ^ Leslie, Neil. "The Kaliningrad Missile Crisis". Retrieved December 14, 2016. ^ "Russia to deploy missiles in Kaliningrad to counter US threat". Xinhua News Agency. November 6, 2008. Retrieved April 2, 2010. ^ "Obama cancels missile defense and changes transatlantic politics". The Globe and Mail. Toronto. September 25, 2009. ^ Медведев решил не размещать "Искандеры" в Калининградской области RIA Novosti, 26 September 2009. ^ "Russia's radar to counter missile shield, says Medvedev". Sputnik. ^ Россию заподозрили в размещении ракетных комплексов «Искандер» на границе с ЕС Lenta.ru, 15 December 2013. ^ "Putin Says No Iskanders Deployed in Kaliningrad". Sputnik. ^ "Poland and U.S. Army hold joint air defence exercises near Warsaw". Reuters. Retrieved 8 October 2016. ^ "Минобороны подтвердило переброску "Искандера" под Калининград". ^ "Russia moves nuclear-capable missiles into Kaliningrad". 8 October 2016 – via Reuters. ^ "В Госдуме раскрыли цели переброски "Искандеров" под Калининград". Lenta.ru. 2016-10-15. ^ Russia deploys Iskander nuclear-capable missiles to Kaliningrad: RIA Reuters, 5 February 2017. ^ В ГД подтвердили, что комплексы "Искандер" разместили под Калининградом RIA Novosti, 5 February 2018. ^ В Калининградской области завершили создание зоны под "Искандер-М" RIA Novosti, 31 January 2018. ^ ""Искандер" здесь, "Искандер" там". 29 September 2009. ^ note other sources now place the brigade at Birobidzhan. http://www.ww2.dk/new/army/rbr/23rbr.htm and warfare.ru. ^ a b Harutyunyan, Sargis (3 June 2013). "Advanced Russian Missiles 'Deployed In Armenia'". Radio Free Europe/Radio Liberty. Retrieved 22 June 2013. ^ «Искандеры» доехали до Армении Vedomosti, 18 September 2016. ^ "Russian forces "capable of being nuclear" moving to Crimea, NATO chief says". Retrieved 2018-03-17. ^ "«Ми добре знаємо про наявність російських комплексів „Іскандер" на території тимчасово окупованого Криму», — генерал-майор Олександр Розмазнін". Міністерство оборони України. Retrieved 2018-03-17. ^ "Ukraine military say Russia deploys Iskander air defense missiles in Crimea". Kyiv Post. 2014-12-04. Retrieved 2018-03-17. ^ Loiko, Sergei L. "Russia says it has a right to put nuclear weapons in Crimea". Los Angeles Times. Retrieved 2018-03-17. ^ Keck, Zachary. "Russia Threatens to Deploy Nuclear Weapons in Crimea". The National Interest. Retrieved 2018-03-17. ^ "Jeremy Binnie, London: "Iskander missile launcher spotted in Syria", IHS Jane's 360, 31 March 2016". ^ Majumdar, Dave. "Report: Russia's Dangerous Iskander-M Ballistic Missiles Are Now in Syria". The National Interest. ^ Tomlinson, Lucas (8 February 2017). "Russia sends Syria its largest missile delivery to date, US officials say". Fox News. ^ "Russian Aviation in Syria Carried Out Up to 100 Sorties Per Day - Minister". Sputnik. 17 December 2018. Retrieved 5 February 2019. ^ a b "Почему ОТРК "Искандер" так пугает наших соседей". Retrieved 23 December 2014. ^ "Оперативно-тактический ракетный комплекс 9К720 'Искандер'". Retrieved 23 December 2014. ^ a b "Не смешите мои "Искандеры": США хотят наказать РФ за "неправильную" ракету". riafan.ru. 9 December 2015. Retrieved 21 November 2017. ^ "Russia Again Flight Tests Illegal INF Cruise Missile". The Washington Free Beacon. 28 September 2015. Retrieved 21 November 2017. ^ "США: Россия получила ракету, нарушающую договор РСМД". Vedomosti. 14 February 2017. Retrieved 21 November 2017. ^ "Якобы развернута, будто бы нарушила". Lenta.ru. 17 February 2017. Retrieved 21 November 2017. ^ "New ballistic missile created for Iskander tactical system". Retrieved 8 October 2016. ^ Sputnik (2017-09-14). "Iskander Systems Developer Takes INF Treaty Into Account When Creating New Arms – Sputnik International". Sputniknews.com. Retrieved 2017-11-30. ^ <%= item.timeFlag %>. "Military & Defense – Iskander-M system gets new types of missiles — manufacturer". TASS. Retrieved 2017-11-30. ^ "Чемезов: ракетные комплексы "Искандер" не пойдут на экспорт". Retrieved 8 October 2016. ^ "New Russian "Iskander" missile complexes cannot be exported - Defence Blog". defence-blog.com. ^ "Iskander (SS-26 Stone)". military-today.com. Retrieved 21 November 2017. ^ "Комплекс 9К720 Искандер - SS-26 STONE - Структура комплекса и хронология - MilitaryRussia.Ru — отечественная военная техника (после 1945г.)". Retrieved 8 October 2016. ^ "ЦАМТО / Новости / В войска Южного военного округа поступил второй бригадный комплект ОТРК "Искандер-М"". Retrieved 8 October 2016. ^ "Южный военный округ получил комплексы "Искандер-М"". РИА Новости. Retrieved 23 December 2014. ^ "По-прежнему боги войны". Retrieved 23 December 2014. ^ "НПК "КБМ" передала Минобороны третий комплект ОТРК "Искандер-М" для оснащения ракетной бригады". Retrieved 23 December 2014. ^ "Ракетная бригада ЦВО перевооружена на новейшие оперативно-тактические ракетные комплексы "Искандер-М"". 20 November 2014. Retrieved 23 December 2014. ^ bmpd (17 July 2015). "Сухопутные войска России получили шестой бригадный комплект "Искандеров-М"". Archived from the original on 25 December 2015. Retrieved 8 October 2016. ^ "ЦАМТО / Новости / АО "НПК «КБМ" сдало Минобороны РФ шестой бригадный комплект ОТРК "Искандер-М"". Retrieved 8 October 2016. ^ ""Искандер" научили взрывать метро по фотографии". Retrieved 23 December 2014. ^ bmpd (29 June 2016). "20-я гвардейская ракетная бригада получила комплект ракетного комплекса "Искандер-М"". Retrieved 8 October 2016. ^ "Министр обороны подтвердил передачу "Искандеров" 41-й армии ЦВО - Еженедельник "Военно-промышленный курьер"". vpk-news.ru. ^ "Russian Army Receives Iskander Missile System, Kalibr Cruise Missiles". Sputnik News. ^ bmpd. "Контракт на еще два бригадных комплекта оперативно-тактических ракетных комплексов "Искандер-М"". bmpd.livejournal.com. ^ "Russian Defence Ministry to receive two brigade sets of the Iskander-M tactic missile complexes : Ministry of Defence of the Russian Federation". Eng.mil.ru. 2017-08-24. Retrieved 2017-11-30. ^ <%= item.timeFlag %>. "Military & Defense – Russian troops receive brigade set of Iskander-M ballistic missile system". TASS. Retrieved 2017-11-30. ^ Administrator. "Armenia will receive weapons from Russia under a $100 million loan - March 2018 Global Defense Security army news industry - Defense Security global news industry army 2018 - Archive News year". www.armyrecognition.com. ^ "ARMENIA RECEIVES FIRST RUSSIA-MADE ISKANDER-M MISSILE SYSTEMS". South Front. 16 September 2016. ^ "СМИ: Армения получила российские комплексы "Искандер-М"". Vzglyad (in Russian). 16 September 2016. ^ "Vedomosti: Russia shipped four Iskander missile systems to Armenia". ^ Виген Саркисян: "Искандеры" принадлежат Армении, управляем ими мы RIA Novosti, 22 February 2017. ^ "Россия поставила ОТРК "Искандер-Э" в одну из стран Северной Африки". RIA Novosti. 15 November 2017. Retrieved 17 November 2017. ^ Binnie, Jeremy (16 November 2017). "Russian official says MENA country has Iskander-E missiles". IHS Jane's 360. Archived from the original on 18 November 2017. Retrieved 18 November 2017. ^ Langloit, Philippe (22 November 2017). "Les Forces Armées Algériennes". DSI Magazine. France: Centre d'analyse et de prévision des risques internationaux. pp. 56–57. ^ "Российское оружие удержало свое место". Газета "Коммерсантъ". 2018-05-03. p. 1. Retrieved 2018-03-06. ^ "Iskander (SS-26 Stone) Short-Range Ballistic Missile". Military-Today. 2010-12-31. Retrieved 2011-05-15. ^ "9К720 "Искандер" - оперативно-тактический ракетный комплекс". Retrieved 23 December 2014. Wikimedia Commons has media related to 9K720 Iskander.